The tragic story of Irène Némirovsky, the Jewish war-time author of Suite Française (published in 2004 after being hidden for over sixty years, after her death in a concentration camp), is listed before the end credits of the film adaptation, and it turns out to be a more interesting tale than what audiences will have just seen. 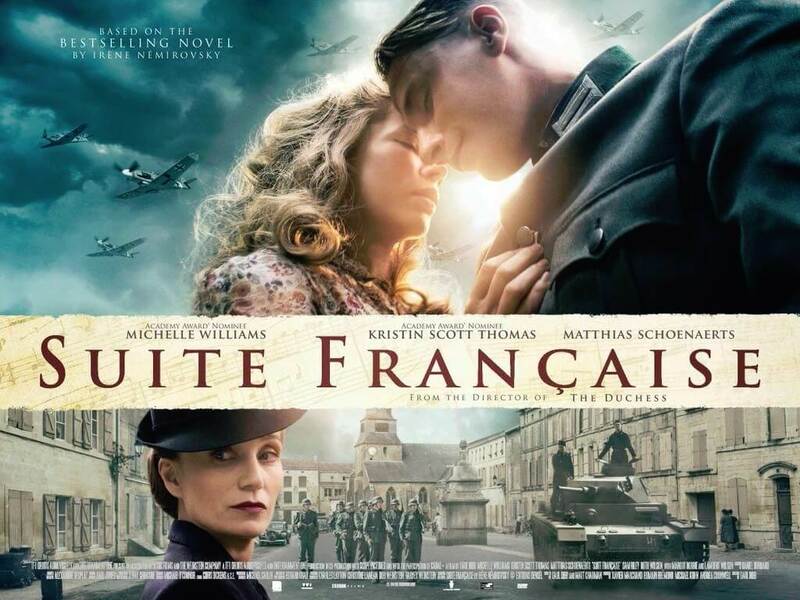 Suite Française, directed by The Duchess’ Saul Dibb and featuring an impressive line of international actors living in a French village where most people speak English for some reason, is by no means a bad film. It is very well crafted with its stunning production and costume design, while Dibb is competent enough to draw real emotions from his performers as well as inject small levels of tension wherever it’s needed. The performers are very good too, including Michelle Williams who manages to sell her character’s quieter moments with beautiful aplomb, and Kristin Scott Thomas who seems to revel in playing a borderline caricature with her pouty and controlling mother-in-law. Ruth Wilson and Margot Robbie, in smaller but significant roles, also shine; while Matthias Schoenaerts brings humanity to a man driven by order and duty (and we never thought we’d be saying that about a Nazi!). However, the problem lies in the fact that, as an old-fashioned war movie, it doesn’t do much to keep one’s interest. The adaptation is littered with a few too many genre clichés that keep it from wholly marinating in its own juices, like Schoenaerts’ sole sympathetic Nazi that attempts to provide the idea that not ALL of them were evil footsoldiers. It also struggles to find a consistent tone, being indecisive when it comes to either “brooding melodrama” or “intense thriller” whenever it focuses on Sam Riley’s fugitive farmer and his family. Not helping matters is the constant use of shaky-cam which renders certain scenes hard to watch, especially when they contain important plot beats because the shooting method makes it hard to comprehend what is actually happening and to whom, tarnishing any real intensity and suspense the scene otherwise suggests. Némirovsky wrote a small inter-connected anthology with Suite Française, with this film being primarily based on the second novella entitled “Dolce”. As such, there is a lot of story to represent in less than two hours of screen time, and while it is a noble effort to reduce the focus down to just one section, there are some resulting setbacks that hurt the narrative of this film. Some elements feel very rushed, including the sporadic relationship between Schoenaerts’ Bruno and Williams’ Lucille which SHOULD be the main focus of the movie but is played very inconsistently amongst the many other plots that are occurring, and it ends up being more like a side-note in its own movie. The film also relies heavily on expository dialogue, mostly through narration delivered by Williams which shamelessly lists out every significant plot beat at random times as if we were struggling to keep up. This leaves little room for real character to shine through, and it can become somewhat hollow as a result. The narration also undermines any satisfying conclusion to many of these storylines, simply stating characters’ statuses by the end instead of just showing them to us as it tries to cover up the sore fact that, as a narrative, it just feels incomplete and without real merit gained whatsoever. Now, you can make a very strong argument that since Némirovsky was not able to complete her story prior to her capture and death, the filmmakers might have strongly decided in favour of ending their adaptation as it does to highlight how similar the premature cut-off was in her novel. After all, despite publication it is still an unfinished piece of work with only mortality getting in the way of it being finished, a fate which was also met with Charles Dickens’ The Mystery of Edwin Drood, which was left incomplete upon the author’s death in 1870. Unfortunately, because this is meant to be a film version of the source material, what was needed for Suite Française to work as a film was something closer to an actual whole, instead of something that just ends at an exact point.